High in antioxidants, Beta Carotene, Vitamins E & C, and Super Oxide Dismutase. Rich in Chlorophyll which can improve tissue oxygenation--important in building blood. High in minerals; wheatgrass picks up 92 of the 102 Minerals in soil. One ounce of Wheat Grass is equivalent to over 2 lbs. of fresh fruits and vegetables. It acts as a natural appetizer suppressant. Enhances Energy Levels by fulfilling nutritional deficiencies and by removing wastes that clog your cells, blood, tissues and organs. Natural Aid For Weight Loss. Wheat Grass helps dieters by speeding up blood circulation and metabolic rate and by enhancing digestive powers, thereby melting excess fat in the system. Just Pour in Seeds and Plug it in. 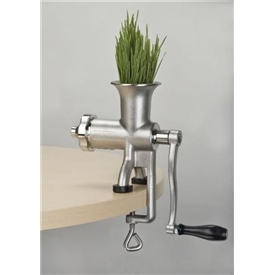 Made of high quality, matt-finish Stainless Steel, the MJ445 manual wheatgrass juicer has raised the bar in quality and efficiency. Delicately extracts the juice from wheatgrass and other leafy greens. Revolutionary new auger design for maximum juice yield. 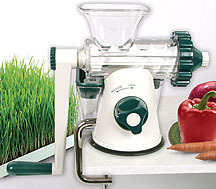 The Zstar Z-710 Manual Juicer makes it affordable to be able to juice wheatgrass at home, or on the go. 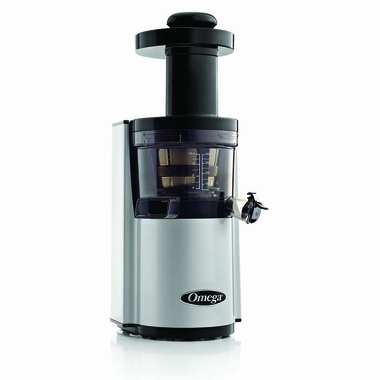 The Z-710 features an Ultem juicing screen and auger and is virtually BPA-free. 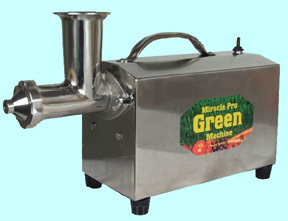 The unique single auger design uses an extremely gentle and efficient process to extract more high quality juice from each blade of wheatgrass, without electric power. Not only can it juice wheatgrass, the Zstar Manual Juicer can also extract great tasting and nutritious juice from a variety of fresh fruits, vegetables, and leafy greens. Without the handle it is only 4.25" wide, 7.5" high by 8" long. The handle is 8" long. 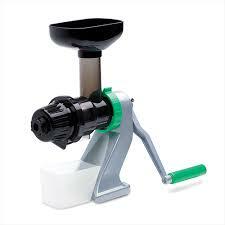 into the widemouthed opening of the juicer also doubles as a handy lever to assist in attaching and removing the suction base. Another wrench is included to help tighten or loosen the end cap cover. 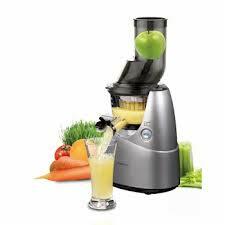 The Healthy juicer is manual and does not require electricity. Sets up in seconds, no electric cords to plug in or motors to burn out. New improved combination Clamp and Suction Base attaches to almost any surface. Newly added-- A sturdy chrome plated corrosion-free metal clamp that can be used by itself or along with the suction base. Low rpm (manual turning) eliminates heat build-up. Preserves more fiber, taste and nutrients. Excess waste is neatly expelled from the front. 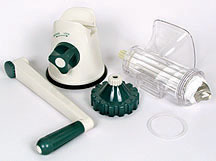 Includes juicer cup and strainer. A custom 16oz juice cup and stainer is also included to collect the juice extracted from wheatgrass. The strainer is removable so you have the option of not removing the pulp. 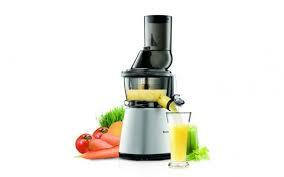 Do not be misled by the low price of the Healthyjuicer. All parts of the juicer are made of tough Polycarbonate (Lexan) which is practically indestructible. The parts of the juicer that receives the most force (the tip of auger and the inside of the end cap) are made of stainless steel. 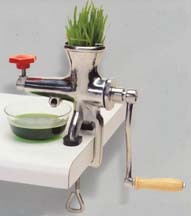 An efficient electric wheat grass juicer for home use. For wheat grass, berries, and soft fruits like currants, grapes, tomatoes, etc. The elements that touch processed food are made of nylon and other non toxic materials. Self feeding screens are made of Stainless Steel. and other fruits and vegetables. 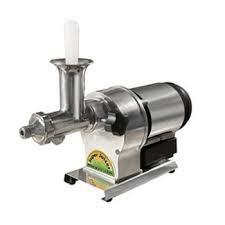 Multiple Functioned Juicer Low RPM TWIN GEAR technology. Top-of-the-Line choice for wheatgrass juicing as well fruits and vegetables. crushes and presses food instead of cutting and shredding, retaining more enzymes and nutrient value. Dual-Stage Juicing Technology - process achieves greater efficiency which means you get more juice in your cup, and less stays behind in the pulp. and other fruits & vegetables. JUICER TAP -simply open and release the mixed juice into your glass. Chute to Juice Whole Apple, etc. While the juicer is able to produce a high output of foam-free juice, it is also ultra quiet in operation. PLUS FREE "Wheatgrass Juice - A Basic Guide"
for wheat grass and other leafy greens. It juices carrots, apples and most other fruits and vegetables. 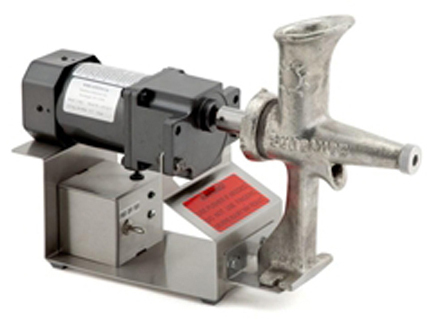 Stainless Steel Housing, Auger & Body - its body and juicing parts are all stainless steel for strength and purity. New Design Stainless Steel Auger - unique, new single auger design ensures maximum juice yield with the driest waste pulp and minimal foaming for nutrient protection. The juicer has a incredibly efficient design where it is able to produce an impressive 183 lbs/cm of Torque from a low power consumption of just 75 watts of power. 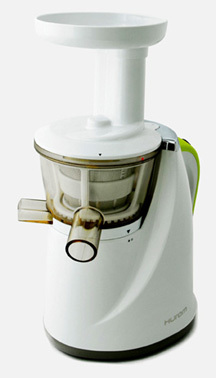 The motor also features unique forward and reverse action so that grass that may become tangled and clogged is instantly untwisted and pulled into the juicer without the user having to reach into the mechanism. Dimensions: 7" x18" x 13"
Total shipping weight 29 lbs. *Not all products have free shipping. Those items with free shipping will have "Free Shipping*" above or below the "Add to Cart" Button. Free Shipping offer applies only to continental U.S.